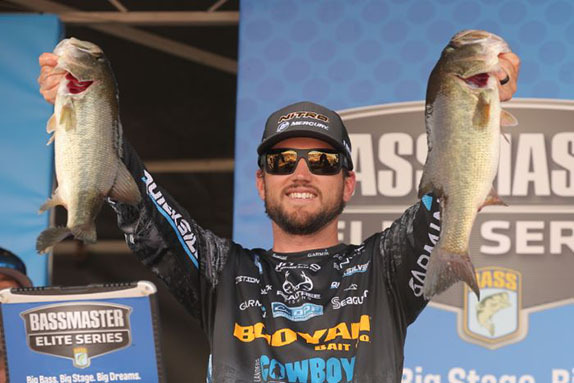 Brandon Cobb averaged just over 18 pounds a day en route to winning the Lake Hartwell Bassmaster Elite Series. Man, those locals are tough to beat in tour-level events at Lake Hartwell! 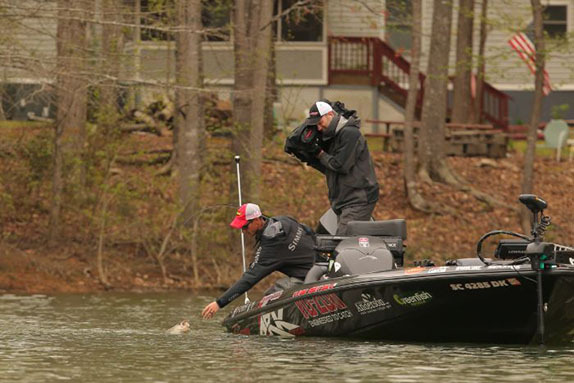 Continuing a tradition started by Casey Ashley, a Donalds, S.C. resident who won the 2014 FLW Tour stop and the 2015 Bassmaster Classic on his home lake, Brandon Cobb made the short drive home to Greenwood, S.C. with the trophy from the first Elite Series regular-season event ever held at the big impoundment on the border that his home state shares with Georgia. His 16-04 stringer in the final round gave him a four-day total of 72-04, eclipsing the mark of runner-up Stetson Blaylock by 3 1/2 pounds. With a 19-09 sack on day 1, the 29-year-old Cobb laid claim to the No. 1 position. He never relinquished it as he continually brought high-teens bags bulging with largemouths plucked from spawning beds to the weigh-in stage in Anderson, S.C.
"I know it's probably clich�, but I don't think it's really set in yet," he said when asked to describe the initial feeling of his first top-level triumph. "Today about lunchtime I figured I had it won, but I didn't know for sure � I've caught 23 pounds at Hartwell and it could've happened for somebody else." Cobb didn't start catching fish until about 9 o'clock on day 4, but boated about 20 over the remainder of the day. That didn't occur, but Blaylock gave it a pretty good run. 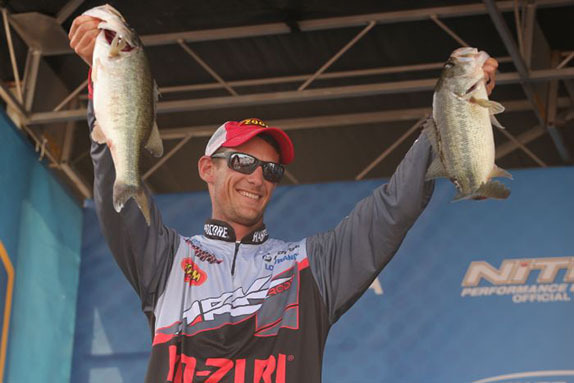 The oldest of the top-5 finishers at age 32, the Arkansan weighed in more than 19 pounds for the second consecutive day to finish with 68-11. 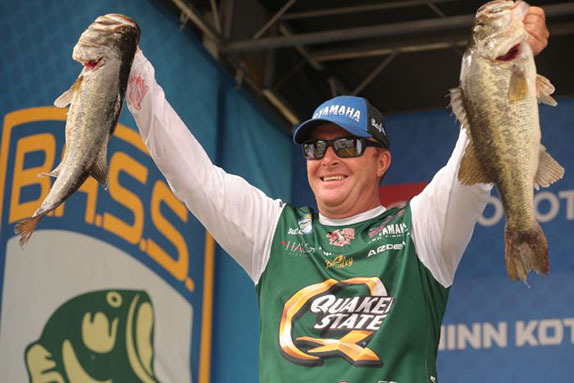 It was his highest placement in three seasons on the Elite Series and his best showing since he was 2nd at an FLW Tour event at Lake Chickamauga in 2015. Micah Frazier, who spent the entire derby among the top 3, finished 3rd with 63-06 (13-10 on day 4. 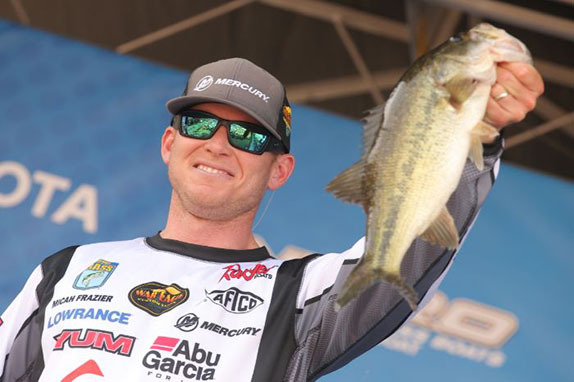 Florida rookie Drew Cook, who has a one-point edge over Cobb at the top of the Angler of the Year (AOY) standings after three events, was 4th with 63-04 (13-13). Shane Lehew, Cobb's longtime buddy and travel partner, completed the top 5 with 61-15 (14-07). Veteran Mark Menendez posted his second single-digit finish of the season as his 61-10 total (16-00 in the final round) was good for 6th place. The remainder of the top 10 consisted of Bill Lowen with 60-15, Jamie Hartman with 59-06, Chad Pipkens with 58-02 and Hank Cherry with 56-08. Cobb didn't have a fish in his livewell until close to 9 o'clock, but he wasn't worried. He opted to try another tactic early on before moving to the extreme shallows to catch fish he could see. "It started out kind of slow," he said. "The (blueback) herring were spawning and the stripers were on them, but the bass weren't. I had to try it because I know how quick you can (load up) if you hit it right. "I'd been culling everything I'd caught in the mornings after 11 o'clock anyway, so it didn't really matter." He eventually boated about 20 keepers and the five he took to the stage were all between 3 and 4 pounds. "At one spot I found three fish on one bed and I caught all three. One didn't help, but the other two were decent females. "I had a few fish (marked) that I could've culled with, but they were pretty far away and I would've been pretty uncomfortable making that long run toward the end of the day." He sight-fished with a Greenfish Tackle shaky-head with a Zoom Trick Worm and pitched a Zoom Fluke Stick to places where he figured beds were present but he couldn't see fish. Stetson Blaylock topped 19 pounds for the second straight day. 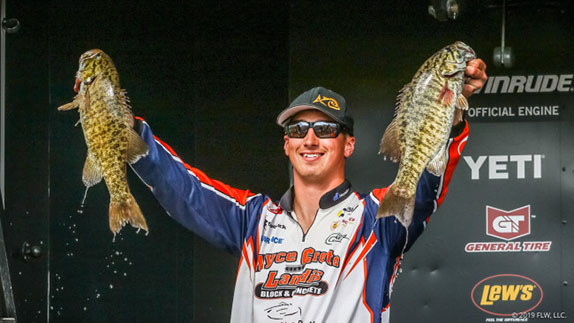 Blaylock fished on Sunday for the second straight event (he was 8th at Lake Lanier in February). He went through about a dozen keepers and his bag was headed up by a 4 3/4-pounder. "I can't complain a bit � I'm excited about (the finish)," he said. "I knew I needed a giant stringer to have a shot to win and I did everything I could do. "it's been a good start to the year so far and it certainly beats the last two years. I'm back to catching some fish and feeling like I did when I used to make the (FLW) Cup every year. I've regained some confidence that I do know how to make decisions." He looked at only two of the fish that he took to the scale. A topwater popper, a frog, a soft stickbait and a finesse worm also generated bites for him. "I definitely didn't look at and catch near as much today. I actually saw quite a few, but they weren't biting that good and they weren't locking down. "The frog fish I caught was probably spawning. The one on the (Rebel Pop-R topwater), from where it was sitting, I don't think it was (on a bed). I think I just made the right cast at the right time." Frazier ran all new water in the final round. He said he caught a lot of fish, but his biggest on the day wasn't much over 3 1/2 pounds. "I scrapped the area I'd been fishing and went down the lake toward the dam to a place that's historically been good at some point in the spawn," he said. "From what I gathered, it hadn't happened yet, but I kind of went out on a limb hoping that it had gotten good overnight. Micah Frazier stayed among the top 3 in the standings throughout the event. "It was still a little early. I was seeing cruisers and fish rolling, but I couldn't get a lot of them to bite. I'm glad I didn't pass up a lot of 2 1/2-pounders because if I had, I wouldn't have finished 3rd; I'd have been down in 6th or 8th. If I thought a fish would help me and it wasn't going to take forever to catch, I went ahead and caught it." Cook felt good about his high finish and his top position in the points race, but not about his final-day performance. "I had the bites today to make things really interesting, but I just couldn't get them in the boat. I caught one of the four females that I hooked off beds. I lost a 4 3/4, a 5 and one that was between 6 and 7 and I lost the big one twice. "They had to be biting kind of funny because I lost two on a wacky-rig with an exposed hook and that doesn't normally happen." 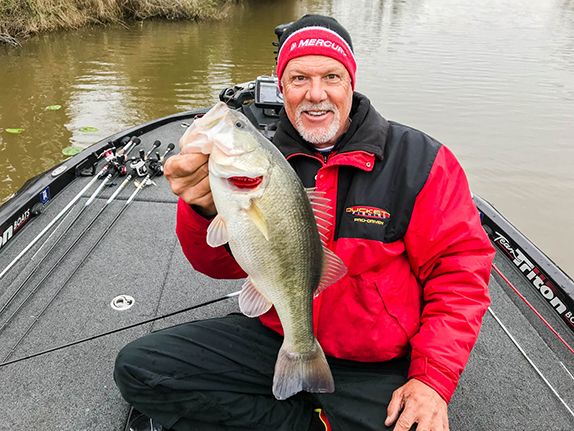 Lehew was happy to post a high finish in the opener of back-to-back tournaments � the circuit moves to stingy Winyah Bay, also in South Carolina, this week. "I really wanted to have a good one before Winyah Bay because I'm not familiar with it at all and Hartwell I kind of was," he said. "I kind of dug myself a hole on the second day (when he caught 13-06), but I was lucky enough to bounce back on the third day (19-08) and make it to today." He caught 15 to 20 keepers, the biggest of which was a 3 1/4-pounder. He missed a 3 1/2 and broke off another that was over 3. "I started the morning throwing a buzzbait and covering some water; it was a little cloudy and the bed-fish seemed to lock on later in the day. I basically ran out of fish after yesterday. I went looking and passed up a lot of 2 1/2-pounders, trying to find a big one. I saw a couple that were 4 1/2 to 6 pounds, but they weren't ready. I'd say there still a couple days away." > Day 4 stats � 10 anglers, 10 limits.